The long and winding road leading to this place will be set aside once you step into this small yet tranquil town of Sagada. That’s what I felt the moment I landed my feet. The thrilling ride, the temperate weather, the breathtaking view of the mountains, the sea of clouds and the hospitality of the locals makes this place a mountain paradise full of adventure. The thought of finally arriving in Sagada made me smile and I am proud that I did it all alone! 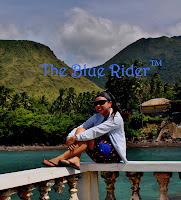 Undoubtedly, the charm of this mountain has captured my heart making it one of The Blue Rider’s favorite destination, I considered the place a home away from home like most tourists do, local or foreigners. This place have lots to offer, whether you came here just to relax and enjoy the breeze and scenes or more into adventures, you definitely have a place here. With the variety of activities to choose from, places to see and foods to eat , Sagada is truly an adventure, nature and food haven. That’s what I came here for. As soon as I stepped down from the Van, I looked for Ganduyan Inn, that’s where I made my reservation for this trip. Good thing it’s conveniently located in the center of the town just across the Municipal Hall and Sagada Public Market. There are other Inns available, here's the List of Accomodations in Sagada. I hurriedly went to the Reception to check in and paid Php 600.00 for a room for 2 with private bathroom. Sadly, when I was assisted to the one reserved for me, we had to walk few meters uphill. According to the caretaker, it’s newly built and the extension of the original Ganduyan Inn. My room is located at the 3rd floor, it has a private bathroom with twin size bed. I also have a private balcony. Just enough for me to spend a day or two. I just love the color of the curtains, blankets and the bathroom. Its BLUE!!! I need to rest and sleep for few hours before I start my Sagada walking tour but my tummy is already growling telling me it’s time to grab some lunch. On top of my list is Yoghurt House and so I walk downhill to look for it. By the way, be ready for endless walking here in Sagada as they don’t have any short distance vehicles except if you want to rent a bike which I won’t recommend. I’d rather walk than punish myself riding a bike uphill. As I walk towards Yoghurt House I pass by the Municipal Tourist Information Center. Tourist visiting the place is recommended to register. I paid Php 35.00 and this serves as my Passport here in Sagada. They also gave me a Map of Sagada for Free. This piece of paper contain all the information I need to know about the place, the Inn/Lodges/Guesthouses available with contact details. The tour packages available as well the standardized rate. Most of the sites can be reached with a great deal of walking and hiking, in short it’s physically challenging.